Yes, I try another Micro$oft product, and I think this great tools for bloggers like me. From now I can post to my blog through Windows Life Writer, just like another Micro$oft prioduct, this have cool layout(I think) and easy to understand navigation etc. This tools just like wbloggar but this Micro$oft product. And if you was use another product such as Perfomancing the Mozilla Extension.. you can try this one. 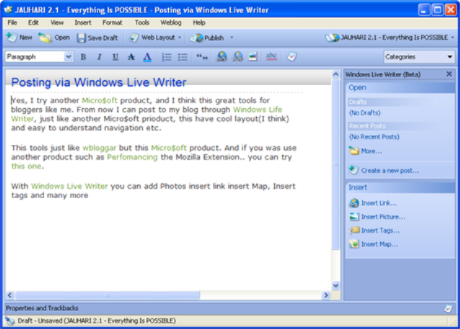 With Windows Live Writer you can add Photos insert link insert Map, Insert tags and many more.